I am always so grateful for my friends. They keep me positive amidst all the strange happenings that go on in our world. Recently I was so pumped to be contacted by my friend eHawk. We have both been swamped in daily projects and both are looking to focus our time towards our long term goals. In an effort to create routine and collaborate, we are jointly filling a sketchbook. eHawk started the book with this page. 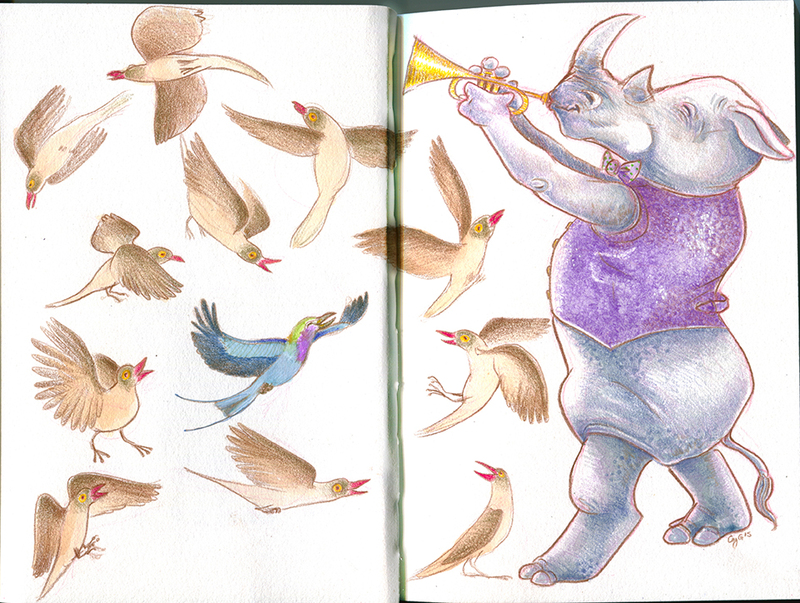 Our plan is to fill the sketchbook each riffing off the other for inspiration of each new spread. From her work, I made this my first page. 10 points for anyone that can identify the birds. This is based on a Southern White Rhino. Bring awareness and keep Rhinos in our world! We aren’t setting deadlines for this project. You will just have to keep an eye out. I have mailed the sketchbook back so, look for an update from her on what comes next! Posted on June 8, 2015 by caseyg. This entry was posted in ehawk, joint sketchbook, News and tagged Casey G, Casey Girard, collaboration, ehawk, eveninghawk, rhino, sketchbook. Bookmark the permalink.